This is the first in a new occasional Wednesday feature where we explore weekend-wear more in depth. 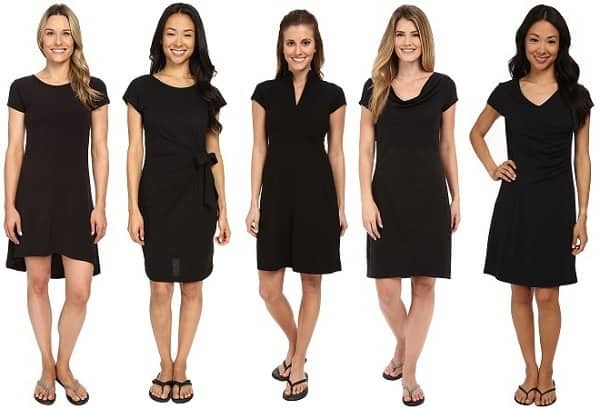 I wouldn’t wear any of these to work, but if you’re on the hunt for a packing-friendly, easycare dress for any upcoming summer travel (or, hey, just brunch or other weekend activities), I thought we’d round up a few. I like that all of these are able to be dressed up and down — wear them with flip flops and a beach tote one day, with a nice necklace, clutch, wrap and fancier heels the next. The plus-size option from Travel Smith is even four dresses in one — two necklines and a reversible fabric! 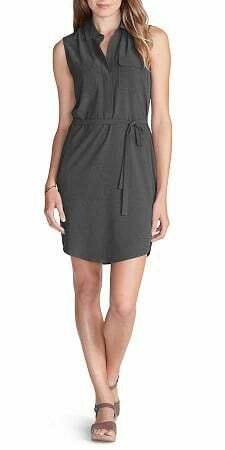 Ladies, do you have any favorite travel dresses, or favorite adventure clothing companies? What is your must-pack item for every vacation you go on? Pictured: Woolrich / Eddie Bauer / Lily Pulitzer. Super cute dresses! Love this new post idea! Can any of the therapy veterans here speak to the idea of things getting worse before they get better in therapy? I’ve been in therapy for 4.5 months now. We worked through managing some daily anxiety issues, and we’re only just now starting to dig deeper into childhood issues. We uncovered some very startling info yesterday, and as I’m processing today, I’m feeling like I wish I could put the genie back in the bottle. My therapist says everyone has issues. I know that’s true, but I feel like before I started therapy, I just had issues like everyone else; now I have Issues. The awareness of my problems – and potentially the size of them and “how long is it going to take to fix this because I want a husband and a family and this stuff kind of interferes with that” – is making me feel uncomfortable with myself, like I’m defective. I went into therapy for what I thought was a quick anxiety issue and now I’ve got this Monica’s-secret-closet-on-Friends worth of childhood stuff to deal with. This will go away and get better with time, right? Your future self will thank your current self for putting the work in so that you can handle life’s challenges with improved coping skills. Better to uncover those Issues under the care and guidance of a therapist than on your own many years from now. It’s like exercising. It can be painful and leave you feeling “sore” but it’s good for you and ultimately each day’s work makes you healthier and better able to care for yourself. The issues were always there in the background, they just have a name now and you can’t pretend to ignore them. I think it is Senior Attorney who says “the only way out is through”. That applies here. It will get better, but it may get worse first. What is on the other side of it is worth it. BTW, in Brene Brown terms, you have a “vulnerability hangover” today. Just breathe through it. Love the new feature! I feel like my entire closet consists of thiss!te-inspired workwear, but I have pretty much no casual wardrobe. My weekend wear is either something I wore to work that week or something that’s left over from college/law school (which, if I’m honest with myself, is probably no longer appropriate or in very good shape). What do you think about the travel blazer? Maybe it’s just me, but I prefer to avoid travel-targeted dresses — when I look back at my vacation pictures I don’t want to be in the same black dress 3 out of 7 days. I prefer to pack relatively fewer and plainer “bottoms” — my latest winner is a medium gray Three Dots maxi skirt — to maximize packing space for cute tops and accessories. They’re the type of thing I’d buy if I’m backpacking somewhere and going to be hauling things around (I mean, if I was going to take a backpacking vacation, which I’ve never actually done), but for a regular vacation where I’m mostly staying in a few places with reliable/easy transport, I follow your theory. Yeah, I never was into “travel” clothing until I went to Vietnam/Cambodia a few years ago. I thought I had done a good job packing but I just felt wilted in my cotton and linen tops and bottoms. The only woman in our group who looked fabulously put together the whole time was wearing “travel” separates — olive and black pants, white shirt, maybe an olive shirt, maybe a few others — and she looked cool and appropriate with just the addition of a scarf or necklace here and there. Lesson learned for traveling in the tropics! I have a nice grey skort I bought from Athleta a year or two ago that probably qualifies as travel clothing and which is just generally fantastic to wear in the summer. Performance fabric so it’s comfortable in the heat, skort so it looks more polished than shorts but is more functional than a skirt, and a nice basic grey color to it pairs well with everything. Seriously, you could wear it hiking up a mountain one day then to a nice dinner the next with a change of shirt and shoes. Can anyone commiserate on health insurance issues? I’m still trying to fight my old insurance company to pay for newborn care for my baby (he’s six months old now). When moving insurance companies due to the “qualifying event” we failed to date the paperwork properly so the new insurance policy was not in effect until 4 days after his birth. My old insurance company and the new insurance company both refused to pay for newborn care in-hospital. I keep arguing that per the ACA someone has to pay for it! But that does not appear to be working. It’s not so major that it will cripple us financially or anything, but it is incredibly frustrating when health insurance just does not work the way it is supposed to (and per the law). It makes me realize how easily families can ruin their credit/go bankrupt from medical bills. This issue is small potatoes for us, but I realize this problem is enormous for many. SO is fighting with his old health insurance company about paying for a flu vaccine. It’s a very small sum, and he was going to let it go, until after he corrected their first reason for denial (wrong procedure code), they sent a another letter saying it was denied because the flu shot (which he got at Walgreens, not some shady clinic or something) was not an FDA-approved vaccine. That sounded so absurd he decided it merited a response. I can’t wait to see what happens. I was exposed to rabies (bat exposure) and my insurance rejected the rabies vaccine shots saying they were not age appropriate vaccines. I had to call six times (six shots – each shot was billed and rejected separately). One phone call fixed it each time, but it does beg the question that perhaps their computer system isn’t working properly. With a needed but not emergency treatment coming due in 2016, I switched to the pricey no-deductible plan this year and am stuck with an FSA to spend down. Ugh. But I was being a “smart” healthcare consumer like we are told to be by our government. Then I get a bill for a $1500 deductible!!!! After 2 weeks of badgering and a hipaa waiver, my insurance co realized that, no, my insurance does not have a deductible, much less a $1500 deductible. They have graciously agreed to reprocess my claims for the last 5 months. If I am going to be charged a deductible, I am switching back to a HDHP with HSA. Ugh. Call your local congressperson and any other reps. They can be incredibly helpful. I wrote a letter for a friend disputing a huge ER bill and CC’d all of her local reps on the letter and it was resolved almost instantly. It took me a year and a half to resolve an issue, despite the fact that the insurance company owned up to billing it wrong on the first call immediately after billing. Advice: Call biweekly, keep copious notes including the names of everyone you speak to, and once you have a solid track record of calling biweekly, threaten to contact your state’s insurance commisioner. At that point they know you will, and that might light a fire. Worked for me. I’m not a fan of “travel dresses” per se but I always travel in dresses because I find them the most comfortable and easy to dress up or down. My favorite accessory to bring on a trip is a giant scarf (fabric dependent on season), usually something new that I will then associate with that trip. I don’t think I’d wear most of these but the Eddie Bauer dress is surprisingly cute. I like to buy scarves on vacation. Great souvenirs, don’t take up much room in the suitcase. I might have to get the Toad dress. I have another dress in the Samba fabric from Horny Toad by way of Title Nine (also a good source for this kind of thing). The fabric is really nice, very soft, not like that weird shiny travel clothing from Chico’s, etc. I have the Toad dress referenced, and it’s a summer staple. On a somewhat related note, I am looking for new summer clothes – including for a trip to Europe. I’m most interested in things I also can wear on weekends when I return. It seems everything this season is shorter and boxier, which is giving this long-torsed girl major problems at every mid-priced retailer (Nordstrom, Loft, Old Navy and the like) in my Midwestern city. Help! I love this kind of dress for general running around town and momming. I have several from Sports Aurhority, of all places. I also like Robbins, which are available at REI, as well as other places. I have to chime in to recommend Karina Dresses (made in the Hudson Valley by a Brooklyn designer). I discovered them at a store in Woodstock when I was living upstate and have several in my closet now. They’re machine washable, don’t wrinkle and are very plus-size friendly (stretchy fabric, generous cuts, and some styles run from XS to XXL). A travel blogger for Travel + Leisure called them “the perfect travel dress” (I’ve brought mine to the Philippines and Europe, so I would agree). My biggest complaint is that the patterns (in my opinion) are really hit or miss. Lots of polka dots, plaids, florals, etc. My personal style is very low key, and I prefer solid colors that I can wear professionally and dresses or skirts that can be mixed and matched easily for versatility. They’re also more than $100 full price, but they go on sale on the website a lot, so that helps. I’m pretty much Team Dress all the time and have been thinking I should get some like this for hiking and long walks. Seems like they would be cooler than the cotton ones I default to now. I liken to bring a striped tank dress on vacation. I like a tunic/ teedress for travel. I find Old Navy sells cute spring/summer dresses, I found a few 3/4 sleeve Ponte solid color dresses from Old Navy which really held up. Pefect for all season’s business travel.